This is officially the coolest thing I've seen (or heard) this week. 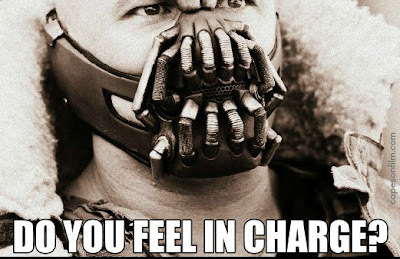 A user of the file storage and sharing site Mega SWF created a soundboard consisting of 26 bits of Bane dialogue from The Dark Knight Rises. As I mentioned in another post, I'm fascinated by the voice performance of Tom Hardy and the work of the TDKR sound designers, so I'm loving this. So far, Hardy hasn't talked about his inspiration for that distinctive Bane dialect, but I detect a little vintage Sean Connery in there. 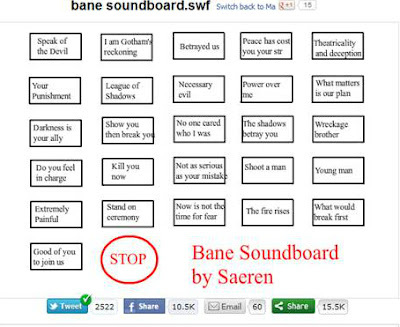 Click on the image below to check out the soundboard and practice your Bane impersonation.